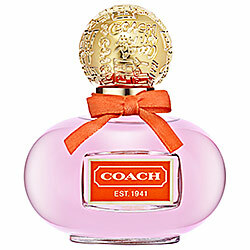 Scent Description and Notes: “COACH Poppy Blossom, an irresistible scent that embraces the many colorful characteristics of the COACH Poppy woman. 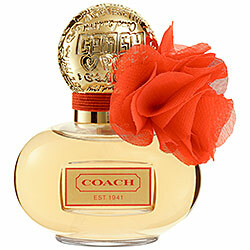 This sparkling, fruity floral fragrance blooms by combining the vivacious energy of COACH Poppy and the floral femininity of COACH Poppy Flower for a fun and playful scent that celebrates the many colorful facets of the COACH Poppy woman. The wearer is whimsical, modern, and subtly sophisticated. Her exhilarating personality lights up the room like a ray of sunshine. Lychee, Mara Strawberry, Freesia, Mandarin, Muguet, Rose Centifolia, Tuberose Fleur, Jasmine Sambac, Gardenia, Praline, Vanilla, Blonde Woods, Musk. Bottle Design and Artwork: I’m including pictures both of the standard bottle and the roller ball set, which is what I have. The set itself has this and Poppy Blossom on it, the blossom end decorated with flowers shapes in a coral, while the Poppy end features the Coach writing in pink. Both are connected by a light gold connector that has the names of each scent printed at either end in small orange font. ITB: IT’s sweet without being retreating – much more assertive than Poppy itself. Part of that is, of course, the jasmine sambac and freesia. However, those two notes are held at bay by the praline (which is impressively distinct), vanilla, lychee, strawberry, and rose. Wet: Immediately, I get a lovely shot of mandarin set against a complex and musky jasmine sambac The vanilla softens the sharp mandarin while the tuberose, gardenia, rose, freesia and lychee shiny brightly and clearly as feminine and sophisticated. Dry: After several hours, the scent is much softer than I had anticipated. Instead of a slightly bitter mandarin note, it’s now a soft, creamy mandarin fluff paired with lychee, musk, vanilla, and an alluring jasmine sambac. Scent Description and Notes: “A youthful and spirited fragrance, the initial spray of this fruity-floral scent delights with bright cucumber flower petals, juicy mandarin, and the sparkling freshness of bright baby freesia buds. In the heart notes, a lush bouquet comes forward, including petally jasmine, pink water lily, Southern gardenia, and the petals of red candied rose. A sweet depth wraps around these floral notes with a rich accord of crème brûlée. In the base, sensual and woody undertones create a lasting impression with notes of cedarwood, bleached sandalwood, lush vanilla, and whipped marshmallow. Cucumber Flower Petals, Mandarin, Baby Freesia Buds, Jasmine, Pink Water Lily, Southern Gardenia, Rose Petals, Crème Brûlée Accord, Cedarwood, Bleached Sandalwood, Vanilla, Whipped Marshmallow. Perfume Oil Color: A slightly pink tint. ITB: My first impression of this is that Poppy is sweet, lively, and fresh. When I concentrate, I can discern the water lily, sweet pink rose petals, bright and innocent gardenia followed by cucumber flowers and freesia. I’m not picking up on vanilla or any of the woods, but it’s a lovely, sweet floral even without it. Wet: It’s a might more acetone-y than I hand anticipated, but it’s not bad with the freesia, lily, sandalwood, water lily, mandarin and fresh cucumber. Dry: The softer, creamier notes come out as it dries down, morphing the scent into a beautiful combination of soft floral (the gardenia is bright while the rose is a soft petal pink note), creamy vanilla and marshmallow, indolent sandalwood, with the clean, almost watery note of cucumber flower petals and water lily. I know that a couple of my students wear this and I don’t feel out of place as someone in my 30s wearing it as well. I think it would work well for a wide band of ages. Scent Description and Notes: “A bright and charming fragrance with a romantic side, Poppy Flower Eau de Parfum mixes light, fruity notes with soft florals and a flirty trail. The scent’s happy and fun personality bursts open with sparkling top notes of grapefruit, wet ivy, and mandarin. The floral heart, at once feminine and vibrantly romantic, emerges with a bouquet of jasmine petals, water lily, and rose. The flirty drydown leaves behind a soft, playful sexiness with notes of sugared raspberry, musk, sandalwood, and creamy apricot skin. Notes: Sweet Freesia, Violet Leaves, Wet Ivy, Juicy Grapefruit, Mandarin, Lychee, Cassis, Jasmine Petals, Water Lily, Rose, Amber, Apricot Skin. Bottle Design and Artwork: This is a standard 1.5ml sample vial. The vial is clear with fuchsia writing featuring the name of the scent, brand, amount, the standard flammable warming, and the distribution information. The brand name and the name of the scent are in blocky bubble letters. In the Vial (ITV): Grapefruit, mandarin, freesia and jasmine. There is a bit of sweetness from the lychee that I get here but not on my skin while it is still wet. Wet: The alcohol base is a bit much on first spray but I can make out mandarin zest, freesia grapefruit, ivy, and water lily. Dry: It’s more fruity once dried – cassis, freesia, mandarin, grapefruit, a hint of apricot, water lily, and shy rose. It’s sophisticated while still being a bright scent.